Not many people can play the linebacker position the way Luke Bakkum (Sr, Oconomowoc, Wis.) does. It is obvious that he has great passion for the game of football and it has truly shown on the field. In each of the past two seasons, Bakkum has led the team in tackles, sacks and tackles for loss. “I love making big hits and getting to the quarterback,” Bakkum said. The 195-pound, 6’1” linebacker started every game dating back to his junior year and has been one of the Blue Devils most consistent defensive players during that time. In 20 games, Bakkum recorded a total of 195 tackles, an average of 9.75 tackles per game. In 2013, Bakkum was selected to the All-WIAC team after his junior season and after leading the conference in tackles, tackles for loss and tying for the league lead in sacks, will likely be selected to the team this year yet again. This year, Bakkum turned in one of the best seasons by a University of Wisconsin–Stout defensive player in a number of years. He recorded 101 tackles, 19 tackles for loss and 8.5 sacks, leading the Blue Devils in all three categories. He also chipped in with an interception, a diving one-hander against University of Wisconsin–River Falls that was key in Stout’s victory. Bakkum, who is majoring in construction, plans on pursuing a job as a project manager or an estimator for a construction company. He wants to stay around this area or work around the Twin Cities. When Bakkum isn’t making big hits or studying for a big construction test, you will find him watching film, which he says is a key role in preparing for upcoming teams, and something that he has definitely improved on. Bakkum saw Stout as a good fit for him, mainly because of the campus atmosphere and the opportunity to play on the football team. 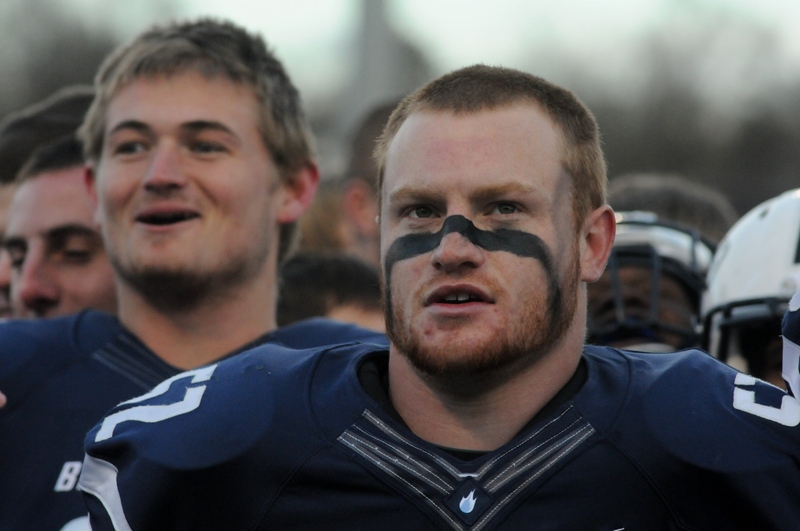 Through all the games played in the senior linebacker’s career here at Stout, one specific win stands out to Bakkum. On that Nov. 2, 2013 game, the Blue Devils overcame the Blugolds in a 35-27 win. Bakkum recorded a team-high 14 tackles in that game. Football has benefited Bakkum off the field as well and has given him skills that he will take past his four years of collegiate football.